The American technology group Emerson is exhibiting at the trade fair for refrigeration and heating technology. This sober, objective description of the facts defines our challenge: to create a space that emotionally touches people and brings them together. Communication zones offer plenty of space for lively discussions. The solution comprises three main buildings, each thematically dedicated to a specific branch of the company, which create a pleasant atmosphere on wide communication zones with wooden tables and warm daylight lighting. Galleries show product and solution proposals. The spacious, surrounding product gallery is a symbolic framework for the holistic demands of the Human Comfort, Cold Chain and Corporate divisions and shows variable product and solution proposals for customer meetings. 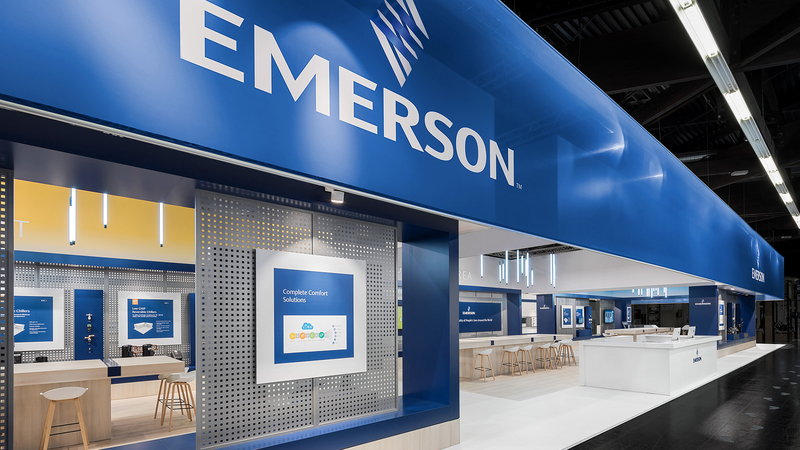 "Together with Emerson, we have identified goals for the trade fair presentation that follow the company's values. With the brand architecture at Chillventa, we are focusing on people, creating clear orientation and promoting dialogue through rooms that make you feel good." Emerson at Chillventa - here you can experience how technology creates a level of well-being for people.